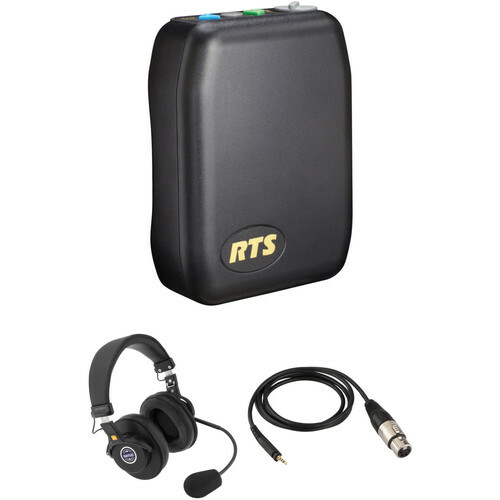 This B&H Kit includes the Telex TR-240 Wireless Intercom Beltpack with a dual-sided headset and an XLR 4-pin to 3.5mm TRRS cable. With wired or wireless operation, multi-level security, and rechargeable Li-ion batteries, the beltpack is well suited for two-way communication in field and studio broadcast applications, and integrates into 2.4 GHz wireless or 2-/4-wire systems. The collapsible headset features a cardioid dynamic microphone on an adjustable gooseneck, which automatically mutes the mic upon being flipped into the vertical position. The Telex TR-240 2.4 GHz Wireless Intercom Beltpack (A4M / Telex) offers high-quality communication and versatile options. The durable ABS beltpack works in conjunction with a BTR-240 base station to provide clear wireless communication using license-free 2.4 GHz IEEE 802.11b WLAN technology. Up to 8 beltpacks can work together in full-duplex mode, while a virtually unlimited number of half-duplex beltpacks can also be added. You can expand your coverage range by adding BTR-24 access points to your system, and the beltpack itself can also act as an access point. The TR-240 has multi-level security and audio encryption to ensure that your conversations stay private. ClearScan channel selection will automatically choose the best available wireless channel. The beltpack also has a 2-/4-wire intercom interface to support wired operation. The A4M / Telex headset connector can automatically detect whether your headset has an electret or dynamic microphone, and will adjust accordingly. The beltpack has easy-to-use color-coded controls for convenient operation. The TR-240 uses a removable rechargeable Li-ion battery that provides up to 8 hours of operation per charge. Note: BTR-240 base station, BTR-24 access point, and additional beltpacks available separately. Designed for wired and wireless communications alike, the Senal SMH-1020CH is a dual-sided communications headset for use in TV or radio broadcast settings, as well as sports applications and behind-the-scenes theater environments. First, you'll notice its deep, padded ear cushions, which offer not only comfort, but isolation and noise-reduction in noisy scenarios. Behind the ear cushions, 40mm neodymium drivers give you a wide frequency response of 20 Hz to 20 kHz, as well as an expansive dynamic range. The microphone supplied with the SMH-1020CH is a cardioid dynamic capsule, designed to minimize pickup of off-axis sound while capturing your voice clearly and intelligibly. It sits upon a durable gooseneck that can be rotated 180°. This configuration can be used on the left or right side of the SMH-1020CH. Additionally, a switch is built into the gooseneck that automatically mutes the signal when it's swiveled into the vertical position; thus, to mute your microphone, all you have to do is flip the gooseneck into the upright position. The SMH-1020CH interfaces with a variety of cables that offer compatibility with many major wired and wireless systems, such as Telex and PortaCom. You can also use this communication headset with broadcast consoles, mixers, and computers. Simply plug your separately-available, corresponding cable into the SMH-1020CH's twist-locking jack, and you're good to go. The headphones are also collapsible, making storage and transportation a cinch. Note: Please note, the SMH-1020CH does not ship with an output cable; for a list of compatible cables, please see our various kit configurations, or contact one of our specialists online, over the phone, or at our illustrious SuperStore. The Senal SMH-H4X is a replacement cable intended for use with SMH-series communication headsets. It can also be used to augment your headset's versatility, giving you the ability to plug into a Clear-Com or PortaCom system if you already have cabling for a different broadcast console or mixer on hand. At one end, you'll find the 3.5mm TRRS connector and corresponding locking jack. This twists into your SMH-1010CH or SMH-1020CH communication headset, establishing a secure and reliable connection all the while. At the other end, you'll note a female, 4-pin XLR connector, allowing you to connect the headset to PortaCom and Clear-Com systems. In fact, the SMH-H4X is part of a whole ecosystem of SMH-series cables, all of which let you swap between the pin-outs of different communication and broadcast systems with ease. The SMH-H4X fits perfectly into the twist-lock of your SMH-1010CH or SMH-1020CH, ensuring a secure connection to your headset. This cable terminates in a 4-pin XLR female plug. This allows you to connect your SMH-series headset to a PortaCom or Clear-Com system. In this way, you can take advantage of the full-duplex communication between ProLink beltpacks and an unbalanced party-line system. Box Dimensions (LxWxH) 13.2 x 8.6 x 3.6"
Box Dimensions (LxWxH) 10.0 x 6.4 x 4.4"
Box Dimensions (LxWxH) 6.5 x 5.0 x 1.1"